A couple of years ago, a friend recommended Dr. Mangigian's office. I am one who dreaded going to the dentist. My experience with the staff has been incredibly positive. I went through a very extensive procedure which led to great results. I am complimented often about the change in my "smile". I have recommended the services of Dr. Mangigian and his staff to many. They are truely professional, very attentive, extremely caring and responsive. Best of all, I consider them my friends. I can’t believe how good this dental office is. I have always had horrible experiences with dentists. I needed to find a new dentist and Dr. Mangigian was recommended to me. I have never had such a good experience with a dentist EVER! I was in a few weeks ago and got my teeth cleaned (best job ever). I needed a crown and had the first appointment. Unbelievable! I asked for nitrous oxide, which I got. I never felt the novacain shots, never had any pain, left with my temporary crown. That night I never felt like I had even been to the dentist. Usually, I would have a sore mouth and be uncomfortable for a few days. I didn’t have any issues at all with the temporary crown. Just got the permanent crown put in easy and painless. I wish I would have found this dental office a long time ago! Dentist and all office staff are wonderful!! I now smile with confidence thanks to Dr. Mangigian. Because of his expertise and experience in cosmetic dentistry, I now have beautiful veneers! Dr. Mangigian and his staff are professional and polite. I know they use incredible lab technicians to ensure that the shape of your teeth and the porcelain used in your smile are as beautiful and as natural looking as possible. My 4 year old daughter loves going to the dentist because they are all caring and make it stress free by providing headphones. Lastly, I always love getting a personalized birthday card written by Dr. Manigian himself to me, it shows he appreciates his patients continued support. Dr. Mangigian and his wonderful staff have treated our family's dental needs for many years. He recently created a new smile for me and I am so happy and confident with my new look. Thank you all for your warm, considerate care and my beautiful new smile. 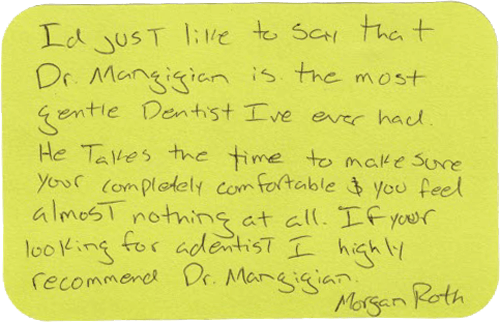 I never hesitate to recommend Dr. Mangigian to friends. I always know I will hear a good report back about how much they like the office. Dr. Mangigian and his staff provide friendly, personal service, and the small office runs well. Since I rarely have to wait and the office allows enough time per patient, it is also an ideal practice for children. As a 25-year patient of Dr, Mangigian with children now of my own, I feel uniquely qualified to give this office a recommendation. I have been a patient of Dr. Mangigian since 2015. Six months ago , I suffered an unfortunate accident in a fall off a ladder while working. In addition to a broken arm, I also experienced a traumatic dental injury. The front five teeth were damaged and had to be removed. Dr. Mangigian and his staff went right to work to restore my smile and confidence . Over the course of the treatment they were amazing. I have visited many dentist in my life,but, I can tell you in no uncertain terms, this dentist and his caring staff are the Best!. 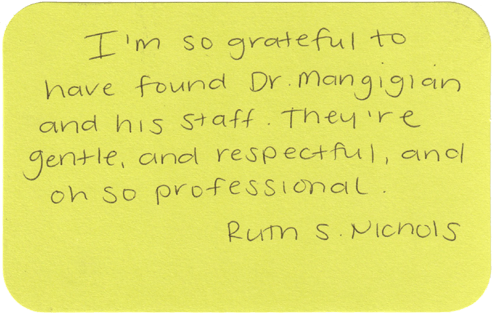 Thank you Dr. Mangigian and staff for your professionalism and caring .